After a rather long wait I finally have an actual set of Nuraphones to experiment with. I’ve seen a ton of feedback filtering in from the lucky few who got their headphones a bit earlier than In did; virtually all of it has been extremely positive. And that’s all fine, but now I can finally do some quick tests and see for myself if the product lives up to the hype. My point of comparison will be my old but still serviceable set of V-MODA Crossfades. I’m quite fond of this headset, and feel it does quite well on build quality, comfort, and sound quality/performance. The Crossfades (and their newer variants) retail for a fair bit less than a brand new Nuraphone, so it should be a reasonable if somewhat easy benchmark for the Nuraphones to surpass. Below are some pictures. I don’t think anything further is required here. The case that comes with the Nuraphones appears well designed and solidly built. It closes with a magnetic clasp, and has a little cubby inside for you to stash your cable (or cables, or other stashables, as the case may be). This appears to be made of the same black silicone/rubber material as the Nuraphone earcups, and attaches to the case using a magnet. So I guess you can swap in alternate color cable-cubbies, if you actually have any. Regardless, the case is quite nice. The build quality on the headphones themselves seems fine. I don’t think they look quite as stylish as the Crossfades, but that’s pure subjective opinion. The ear cups also don’t notch into place as you adjust them up and down, so maybe it’s a bit easier for them to drift out of alignment than on the V-MODA headset, though I haven’t had any such issues so far. The thing I’m least a fan of is the black silicone/rubber that’s used on the earcups and along the bottom edge of the headband. I’m a little concerned about how it will hold up over the long run. Or course, the leather accent and (super-comfy) memory-foam headband on the Crossfades is literally disintegrating on me at this point, so it’s not like they’ve got any advantage; even at a theoretical level. Overall, the build quality is entirely reasonable. Doubly so for a v1 product fresh off kickstarter. 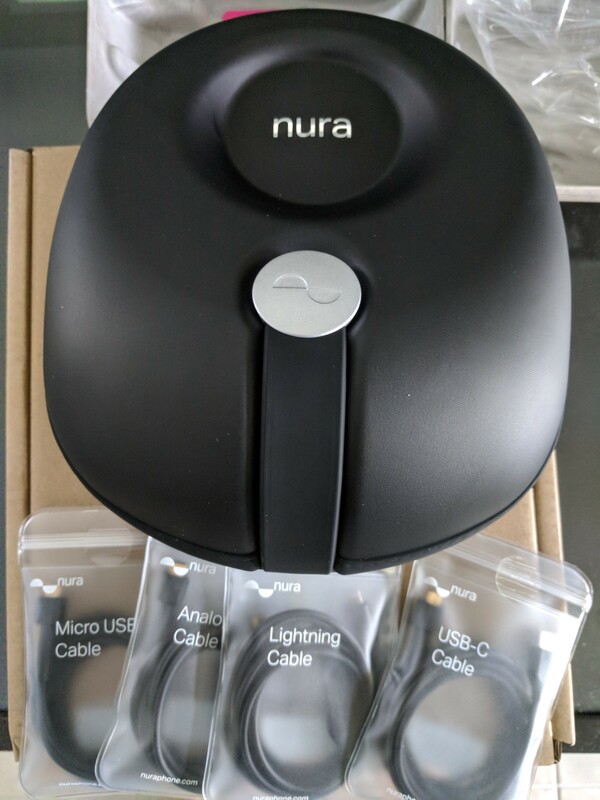 I got to experience some mild panic when I took my freshly unboxed Nuraphones, connected them to their analog cable, and tried to play some music to establish a baseline level of performance. All I got was silence. Long story short, it appears the headset arrived with a dead battery. I discovered this after switching to the USB-C cable, which allowed them to power on and tell me to charge them. 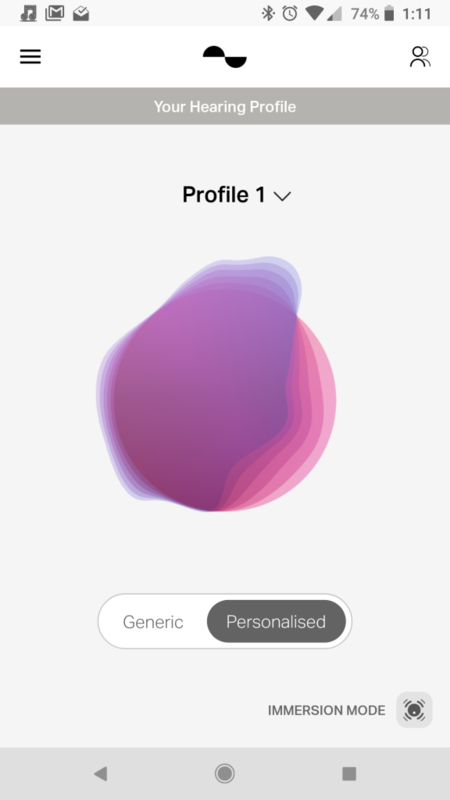 After some time on the charger, it was fairly straightforward to pair them and set up a hearing profile in the app. I found that my hearing profile was consistent across repeated calibrations (and when I had a second person try, they got a completely different profile that was also consistent across calibration attempts), and that I could get a better (and better-sounding) result by running the calibration process with as little ambient noise as possible. By which I mean turning off fans, air conditioners, whirring laptops, and other sources of background noise before running the calibration. I’ve selected a small sampling of test tracks, aiming to get a variety of styles and formats/bitrates under test. I played through the above tracks first on the Nuraphones, jotting down anything that I felt was new or otherwise noteworthy. Then I repeated the sequence on the Crossfades, paying particular attention to whether or not the same details were discernible. The goal is to see if (and how frequently) I can replicate other anecdotal reports of hearing completely new sounds (and instruments) when listening on the Nuraphones. All playback was done using playlister, which does not apply its own EQ or any other effects/modifications to the audio. I won’t force anyone to wade through my detailed notes. Suffice to say, I found 31 “new or otherwise noteworthy” things during the pass with the Nuraphones. On the follow-up pass, I found 10 of those things were sounds that I could hear just as clearly on the Crossfades, 13 were sounds I could subtly or very subtly pick out only after I knew to listen for them, and 8 were sounds that I could not pick at all on the Crossfades despite deliberately listening for them. Probably the best single example can be found in ‘Up to Me’. On the Nuraphones, it’s clear that there are bells sounding around the 1:20 and 1:50 marks; I’d never noticed this before. With the Crossfades, I can just barely pick out the earlier set of bells (they are far more subtle), and the latter set is almost entirely unnoticeable. Also worth noting is that at 128 kbps, ‘Shine’ was basically unlistenable on both headsets. It sounded a bit better on the Crossfades (which doesn’t really count in their favor! ), but had clearly lost too much detail to be of any value in this test. In general, the Nuraphones have a broader dynamic range, clearer and more detailed sound, and far superior stereo separation than the Crossfades. I also found that I wasn’t feeling like I needed to increase the volume of the Nuraphones. Quite the contrary, in fact; I found that I could listen at lower volumes without losing any clarity on the audio. For me, this is literally a first! On the Nuraphones, bass guitar is clear and discernible as being separate from a bass drum. Not so with the Crossfades. Some aspects of operating the Nuraphones are a little strange. There’s a button on each side that can be programmed with a variety of functions. By default the left button toggles personalization on/off. However, unless you’re connected via bluetooth, the buttons are nonfunctional. And you can’t connect via bluetooth while using any of the wired connection options. This limitation (not being able to use the button without an active bluetooth connection) seems quite bizarre and unnecessary. Although I find the buttons are very easy to accidentally trigger when adjusting the headset, so perhaps it’s for the best. You also can’t just plug a fresh set of Nuraphones into a headphone jack and use them like a normal headset; you have to pair them and set up a profile before you can actually listen to anything on them. This is weird, although once you’ve done this you can plug the headphones into any audio source, with or without bluetooth active/enabled, and they’ll work as expected. Since they won’t work without a charged internal battery, I wish the Nuraphones had a power/charge indicator LED on the headset so that I can easily tell, without a mobile phone or bluetooth, if I’m good to listen or if I need to leave them charging for a bit. The Nuraphones do a very solid job here. 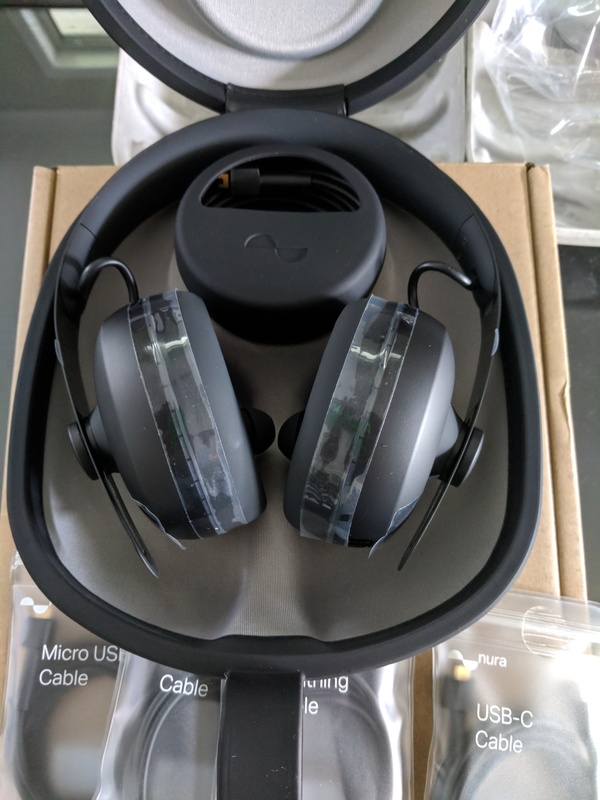 They’re not noise-cancelling, but that black silicone/rubber I complained about earlier absolutely excels at blocking external sounds and distractions. If you’re in a noisy environment like an aircraft, you’ll probably still get some background sound bleeding through. But I’ve used the Crossfades while flying without any problems, and the Nuraphones definitely block out more background noise than the Crossfades. I’ve also been informed that the Nuraphones don’t leak sound into the room, at least not at comfortable listening levels. Quite the opposite with the Crossfades. Full marks to the Nuraphone for this category. Have to give the win to the V-MODA here. The Nuraphones aren’t bad, but the earcups do trap a fair bit of heat and the earbud-like tips do cause some mild fatigue after half an hour or so (and I’ve always avoided earbud-style headphones for this reason). It’s not really a level playing field, however, as the headset designs are completely different. After trying some longer sessions, I’d say that the headset is comfortable enough. For me it’s strictly less comfortable than a purely over-the-ear design like the Crossfades, however. In “Generic” mode, the Nuraphones are quite unimpressive. I’ve seen other people claim they’re deliberately unimpressive. I don’t know if that’s true, but to my ears it sounds like in ‘Generic’ mode the headphones are using only the earbud driver and leaving the second, larger driver switched off entirely. The best adjective to describe the sound would be “tinny”. Extremely, annoyingly, intolerably tinny. But nobody buys a pair of Nuraphones for the ‘Generic’ mode. And in ‘Personalized’ mode they sound much, much better. The audio is smooth and clear, the stereo separation and sound-stage is excellent, the bass is convincing (turn the volume up a bit, and the headphones feel like they want to jump off your head), and there’s plenty of nuance and detail to be heard. I did notice sounds (and entire instruments, and backing vocalists) that I hadn’t noticed before, in any setting. The difference between ‘Personalized’ mode and ‘Generic’ mode is like night and day. The difference between ‘Personalized’ mode and the Crossfades is less striking, but I’d still definitely give the nod to the (personalized) Nuraphones. I think the Nuraphones really excel on more acoustic/instrumental tracks and when handling clear, cleanly sung vocals. Tracks with high production quality and lots of studio polish also tend to shine. Which isn’t to say they’re bad at with other genres/tracks; it’s more the difference between “very good” and “awe inspiring”. And lossless, yes, having lossless copies of your tracks is worth it with these headphones. These headphones work as advertised and live up to the hype. If you’d consider dropping $400+ on a pair of headphones, the Nuraphone belongs on your list of options. 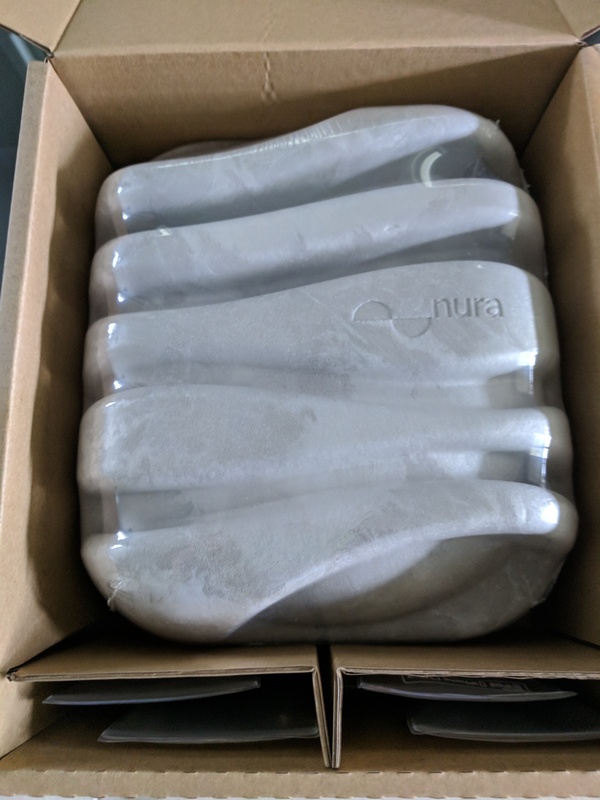 Full disclosure – if six people actually buy a pair of Nuraphones from the link above Nura will send me a free pair. Which I will promptly donate to someone who’ll appreciate them. This entry was posted in hardware and tagged audio, headphones, review. Bookmark the permalink. Just was curious if you were compensated for your review? I’m guessing most major YouTubers were. Looking for opinions on these from someone who doesn’t have the manufacturer staring at them, figuratively of course. Negative. 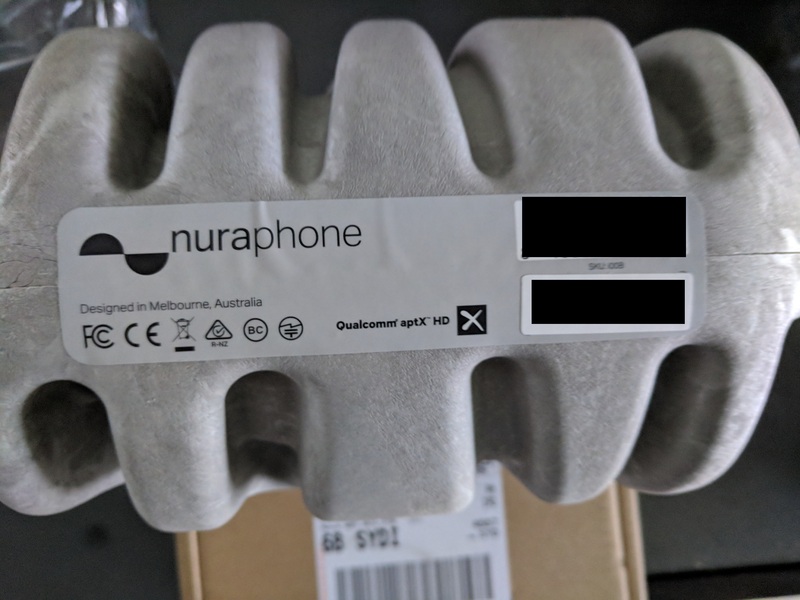 Don’t know about the Youtubers, but the only thing I’ve received from Nuraphone is the referral link at the end of the post. And strictly speaking I have no idea if that even works!